Florence Andenyi is a Kenyan gospel artist, Swahili praise and worship leader. she is woman behind hit song kibali. Born and raised in Kibera, FLORENCE ANDENYI talks about how she remained focused in life and has proven that nobody is condemned to their circumstances. Florence is now elevating the youth from slum life. FLORENCE ANDENYI SICKNESS : In August 2012 Florence travelled to Mombasa to pick a donation of Ksh 20,000 from a sympathetic friend to record her music. On the morning she planned to return to Nairobi, she suffered severe chest, stomach pains and breathing difficulties. She was rushed to the Aga Khan Hospital, Mombasa, where she was diagnosed with severe ulcers and admitted for two weeks. She ended up using the Ksh 20,000 for her medical treatment. She returned home emaciated and her condition deteriorated further in spite of the prescription. The rumour mills were awash that she had AIDS and was on the verge of death. Unable to eat or even get out of bed, she lost a lot of weight giving credibility to the rumours that she was infected with AIDS. Her family was at pains to prove otherwise. Many of her friends including her boyfriend deserted her. A second and third opinion from various hospitals confirmed the earlier ulcers diagnosis. Inspite of different prescriptions her condition didn’t improve one bit. She resorted to taking traditional medicine prescribed by a herbalist from her rural home in Emuhaya in Western Kenya. When she realised that her health wasn’t getting better a month after taking the herbal medication, she discontinued and left her fate in God’s hands. Florence mother, who was the family’s spiritual pillar, also seemed to have lost hope after the death of her son. She was afraid of losing Florence too. Feeling that they were all financially and emotionally drained, the family turned to God in prayer and fasting. “By December 2012, scary dreams and nightmares tormented me in my sleep. I felt death was staring in my face and lost all hope. A friend convinced me to seek God and in January 2013, I retreated to Katoloni Prayer Centre in Machakos for a prayer and fasting period of five days. Miraculously, a month later, my health began improving,” she explains, adding that she returned to the prayer centre to pray for a job among other things. After three months she had regained her health completely and thankfully, she also got a job. Florence dedicated her life to ministering in different churches through gospel music. After completing primary school education, I had no hope of joining high school. It really wasn’t a big concern and it still isn’t a cause to worry for many children in the slums. 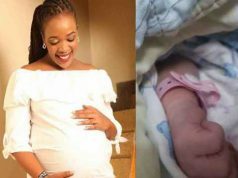 Thankfully, dad got a job as an office messenger later on and our lives changed for the better,” Florence andenyi continues to narrate her early life. 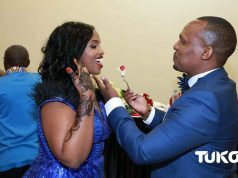 Gods time is the best for sure…as talented artist Florence Adenyi kibali cha bwana lights in her life after she walks down the isle with her partner in 2017. At adolescence, my parents couldn’t afford to buy me sanitary pads and I learnt to improvise in very unhygienic ways. Mine is not any different from the story of many young girls in the slums,” says Florence. “Dad, who was then a tailor operating outside our single-roomed house, was the sole breadwinner. He broke his back fending for us. On many days he didn’t have a paying client. Lack of school fees and necessary stationery greatly disrupted my education and that of my siblings. “Mum ensured I tagged along with her whenever she went to church. I therefore understood about God and became a born-again-Christian at an early age. On realising that I had a singing talent, my Sunday school teachers encouraged me to lead the praise and worship sessions and even coach other children to sing,” Florence recalls how her moral and spiritual grounding began. She explains, “I felt God was insensitive to my prayers after serving Him from childhood and yet I wasn’t developing into the musician I dreamt of being. In October 2011 my brother went down with typhoid due to poor sanitation. Pained by his suffering I prayed and fasted for his recovery after he underwent surgery to correct the intestines that had been eaten away by the disease.